He can really shake it! Do you and your girls love cocktails? Want to try a few and have them made especially for you by your very own barman? We’ve got exactly what you need. 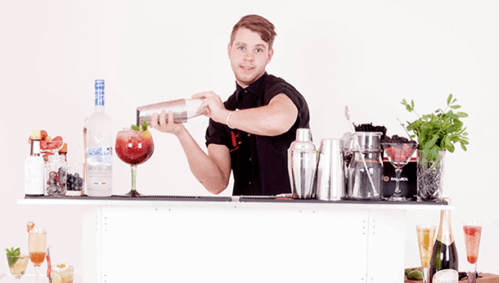 Whether it’s a hen party, birthday bash, or just a special girls night, our mobile bartender can arrive at your party and shake his thing – his cocktail thing! He’ll mix your martinis and shake your mojitos, he’ll even play party games with you! When you hire a bartender you’re getting so much more than a bartender. This guy knows his cocktails and you’ll receive an extensive cocktail menu before the event so you can choose your favourites in your own time. Yes, this is an all you can drink buffet of the best cocktails in town. Our bartender is a professional cocktail maker and you can sample his creations as much as you want within the 2 hours of your bartender hire. When we say unlimited, we mean unlimited, so get ready to sample as many as you want! There’s also free nibbles to accompany all that cocktail drinking, you can even have your drinks and nibbles served by a cheeky butler! Think Tom Cruise in Cocktail, with a wink and a smile as he throws his cocktail shaker in the air and then pours you the perfect drink! What type of cocktails can my barman make? Your bartender can make any cocktails you like. You’ll be provided with a cocktail menu before the event so you can pick out your favourites, but if you have any special requests just let us know, this guy is a professional and he can mix anything you like. Love a Tom Collins or want to try a Manhattan for the first time? He’s got it. He can mix your Margarita and shake your Tequila Sunrise, all with expertise and great showmanship. Whether you like long cocktails with loads of refreshing ice, or you prefer a short cocktail packed full of taste, our bartender can make your special drinks to order. Can a bartender come to my home or rented accommodation? Just call and he’ll be there! Yes, our bartender for hire can bring his cocktail making skills to your party wherever you are. This is a totally mobile service and our cocktail maker can work his magic in any location. If the weather’s fine he can set up outside for an outdoors cocktail session, or he can shake your cocktails in your home or your party venue. He doesn’t need much space to do his thing, so wherever your party’s at, he can be there! What equipment does a bartender bring? Everything you need for fun! Our mobile bartender will bring all his own equipment with him, everything he needs to make your cocktail’s is portable and he can bring it easily to any location. You don’t need to worry about a thing, he has all the drinks to mix your favourite cocktails, his own shakers and stirrers, snacks, and he can set up wherever you want. 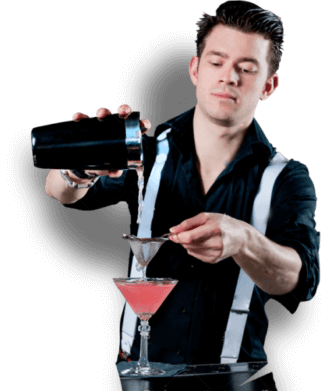 What is the price of hiring a barman & butlers etc? The cost of hiring your very own bartender will vary depending on how long you want him for, how many people in your party, and your city location. To find out how much your private barman will be, get a free quote today!